April 14th, 2016 - COLUMBUS, Ind. 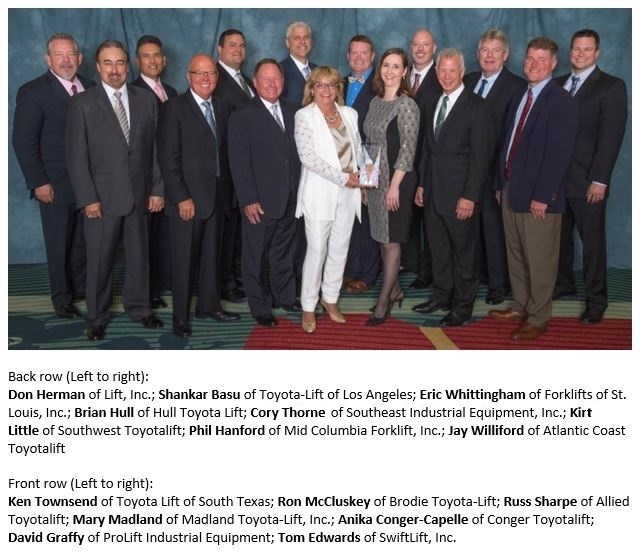 Toyota Material Handling, U.S.A., Inc. (TMHU) recently announced the 2015 winners of its prestigious President's Award. Every year, Toyota selects its top forklift dealers who excel in parts, service and equipment sales, customer satisfaction, and overall dealership operations, and awards them with its highest honor. The winning dealers were announced at Toyota's Annual Forklift Dealer Meeting this month. The group will celebrate together on a Toyota-sponsored trip to New Zealand later this year. "Toyota's President's Award winners set the bar high, and push themselves hard to succeed," said Jeff Rufener, president of TMHU. "They are the best of the best in our industry." Proudly manufactured in the United States, Toyota Industrial Equipment offers a full line of material handling solutions including forklifts, automated guided vehicles, fleet management services and tow tractors. Toyota's commitment to quality, reliability and customer satisfaction, the hallmark of the Toyota Production System, extends throughout more than 220 locations in North America. For more information, visit www.ToyotaForklift.com.